Beautiful set of 2 cappuccino cups with matching saucers from the Le Bleu De Nîmes collection by Tokyo Design Studio. This set is made from high-grade porcelain and each cup holds 310 ml. The saucers are 16.5 cm in diameter . Each cup and each saucer has a different unique dark blue print, which creates a surprising effect. These cappuccino cups and saucers go well together with other items from the Le Bleu De Nîmes range, such as the espresso cups, the tea mugs and the spoons. This set comes in a gift box. Complete your Le Bleu De Nîmes crockery set with this stylish set or treat someone and enjoy a delicious cappuccino. 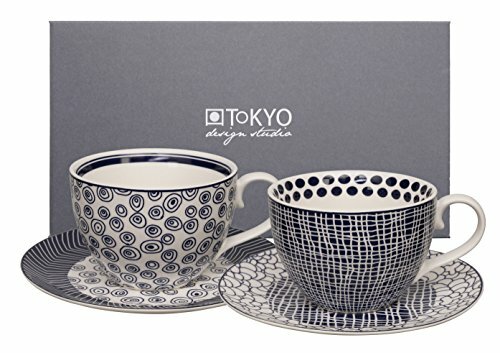 The Tokyo Design Studio cappuccino cups and saucers are dishwasher and microwave safe. The Le Bleu De Nîmes tea and coffee set by Tokyo Design Studio is a unique Asian crockery set with dark blue prints on a white background. The prints are based on a combination of traditional Japanese themes and contemporary trends, which make for a perfect combination. They are also the perfect addition to a white crockery set.